U.N. Human Rights Chief Says She's 'Appalled' At Violence In Syria : The Two-Way Navi Pillay urged the U.N. Security Council to take the Syrian regime to the International Criminal Court. 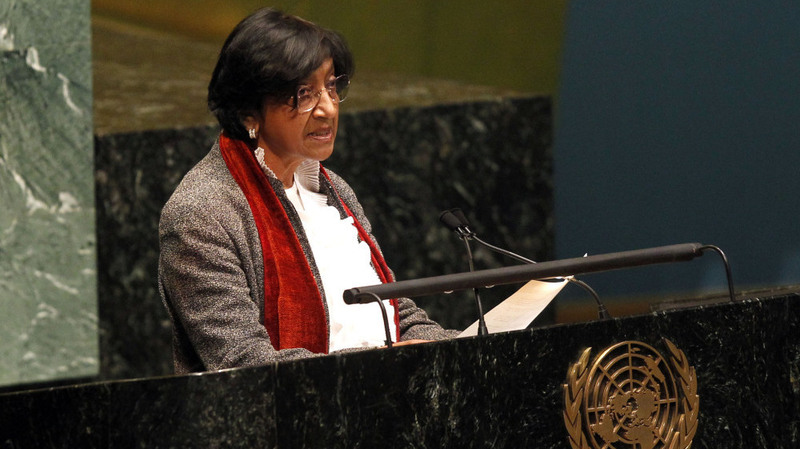 High Commissioner for Human Rights Navi Pillay delivers remarks during a meeting of the United Nations General Assembly to discuss the human rights situation in Syria on Monday. Navi Pillay, the United Nations' High Commissioner for Human Rights, stopped just short of saying that crimes against humanity had been committed by the government of Bashar Assad in Syria. In a speech before the United Nations General Assembly, Pillay laid out her case for why she thinks the Security Council should refer Syria to the International Criminal Court. "I am outraged by these serious violations," she said, according to her her prepared remarks. "I am very distressed that the continued ruthless repression and deliberate stirring of sectarian tensions might soon plunge Syria into civil war. The longer the international community fails to take action, the more the civilian population will suffer from countless atrocities committed against them." -- Syrian security forces killed "well above 5,400 people last year." -- She describes the humanitarian situation in Homs as "deplorable." -- The Syrian regime has used a "shoot-to-kill policy to crush peaceful protests." -- "Several defectors from military and security forces have said that they received orders from their commanders to shoot unarmed protesters without warning." -- Tens of thousands have been arrested and that includes children. -- Thousands are reported missing. Bashar al-Jafari, Syria's permanent representative to the U.N. followed Pillay and he dismissed her claims. "Syria has the right to protect its citizens, combat terrorism and armed violence and put an end for them," al-Jafari said according to SANA, Syria's government news agency. According to a the translation aired on the U.N.'s website, al-Jafari also questioned Pillay's conclusions, saying they were made based on reports and not on first-hand observations by the U.N.
"I say to those trying to destabilize Syria to stop their plots and to help the Syrian government to combat terrorism," al-Jafari said. Meanwhile, the Local Coordination Committees, the coalition of opposition leaders, reported that 23 more people had been killed today.